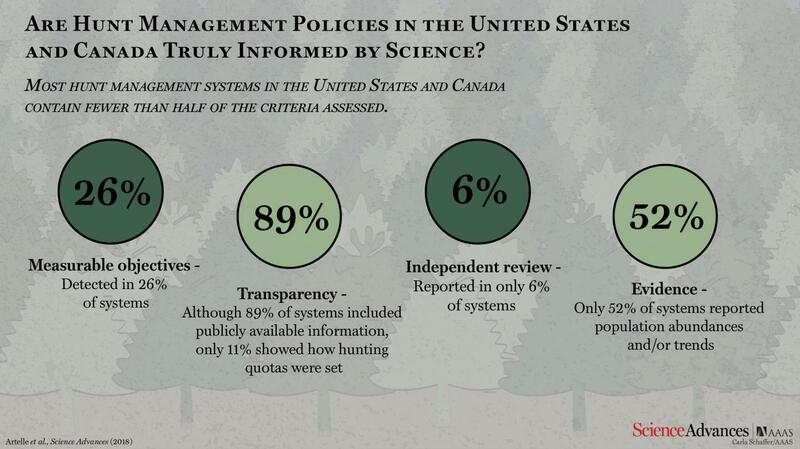 The majority of hunt management policies in the U.S. and Canada do not include science-based approaches in their composition, a new study finds. According to the authors, the results highlight the need for management agencies to more routinely adopt and adhere to science-based approaches, thus leading to better management of natural resources. U.S. and Canadian governmental agencies in charge of resource management often defend their policies, which can be controversial, by claiming that science plays a central role in their structure, but these state and provincial agencies rarely communicate what science-based management entails. To date, there has not been a comprehensive assessment of science's inclusion in these plans. Kyle A. Artelle and colleagues addressed this knowledge gap by identifying four "fundamental hallmarks of science" – measurable objectives, evidence, transparency and independent review – that they believe are indicative of science-based approaches. They tested for the presence of these hallmarks, as well as 11 criteria they say indicate those hallmarks, in 667 hunt management plans across 62 states, provinces and territories in the U.S. and Canada. Most plans, approximately 60%, lacked a scientific approach to management, the authors found; more specifically, most plans featured fewer than half of the 11 criteria. Of note, measurable objectives were detected in only 26% of plans, and only 9% of plans reported any form of independent review. Artelle et al. 's results challenge the popular assumption that management agencies base their systems on science, suggesting that these agencies' policies may warrant review; however, the authors acknowledge, science alone should not shape management strategies. Consideration of social dimensions, such as indigenous practices, as well as ethics are also important, they say.